Amazon.com has RAVPower High Capacity Power Bank Charger for $19.99. This Item ships for Free with Super Saver shipping. 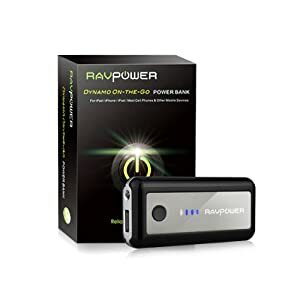 Save $5.00 on RAVPOWER RP-PB04 10000mAh 1A/2A Dual USB Output Power Bank when you purchase 2 or more RAVPower RP-PB03 5200mAh External Battery Charger. Save $3.00 on DreSuit Twill-weave Artificial Leather Case for iPad 2 & The New iPad when you purchase 1 or more RAVPower RP-PB03 5200mAh 1A Output External Battery Charger. Receive 1 RAVPower RP-UA01 iPad PC USB Charging Adapter free when you purchase 2 or more RAVPower RP-PB03 5200mAh External Battery Charger offered. 5200mAh high capacity, the 2 top-rated 2600mAh Samsung 18650 battery cells enable you run 6 extra hours for iPad, 30 hrs extra talk, 140 hrs extra music and 2-3 charges for most mobile phones. Compact & Portable design ensures you the perfect On-the-Go experience. Mini smart outside but giant and powerful inside. Automatically power off function in 20 seconds without charging can largely save the energy. Output: DC 5V 1A; Input: DC 5V 1A; 4 intelligent LED status bar indicates the current battery status; flashlight for night and darkness use. Package includes: RAVPower RP-PB03 External Battery; 7 connectors for most phones; 2 DC to USB Charging Cable; 1 free flannel bag; detailed using instruction.